As part of a pilot program, some Metra riders will start seeing the biggest change to their daily commutes in decades on Wednesday with the debut of coaches equipped with a new style of seats. Instead of the dark green bench-style seats that have traditionally been used on Metra coaches, the new gray and blue vinyl seats are considered “airline-style” with armrests, built-in cup holders and better head, neck and back support, officials say. And, importantly, the new seats are stationary: That is, they don’t flip. Except for 12 seats in each car, the new ones will face the vestibule at the middle of each coach. So only about half the riders will face the direction of travel. That means some customers may have to get used to riding backwards. 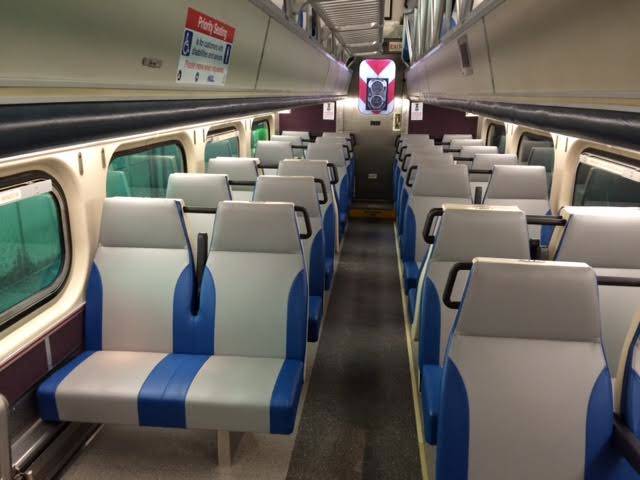 Metra is rolling out the first of 30 railcars with the new seats. That car, No. 7437 (for anyone who wants to spot it), is being put into service on the Milwaukee District lines, which run north to Fox Lake and west to Elgin. Metra plans to add the new seating to two cars per month between now and the end of the year on all lines except the Metra Electric as part of a pilot program. Older model Electric District cars have fixed seats. Customers who use the new seats will be asked to provide feedback starting in February. Metra Executive Director/CEO Don Orseno said Metra hopes riders find the new seats more comfortable than the current ones, and that more ridership will result.